(CBS/AP) HILLSBORO, Ore. - An Oregon burglary suspect dubbed "Moss Man" failed to show up for his trial, and a warrant has been issued for his arrest, authorities said. 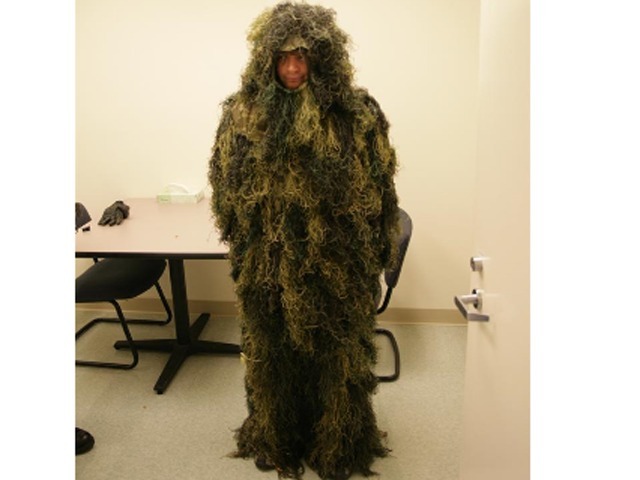 Gregory Liasco of Portland, 36, earned the "Moss Man" moniker after police say he was found in full-body camouflage last October outside the Rice Northwest Museum of Rocks and Minerals, where he'd cut a hole in an outer wall and was trying to break in. Officers found a bike and a backpack, but they didn't find the suspect until a police dog bit what appeared to be the ground. It was Liasco in the camouflage outfit, looking like a mound of moss. Liasco later said the whole thing was a mix-up, and the outfit was a Halloween costume his kids had given him. You might think "Moss Man" shouldn't be that hard to find this time around. Then again, it is a camouflage suit.